This five-day math preparation program is held before the start of the spring and fall semesters and offers a supportive and relaxed environment that will help you overcome any fears or anxieties associated with math through an overview of key mathematical concepts and skill-building sessions that will support the successful completion of the Math course you choose to take. All students that complete the program will receive their Math textbook on loan for free for the semester! 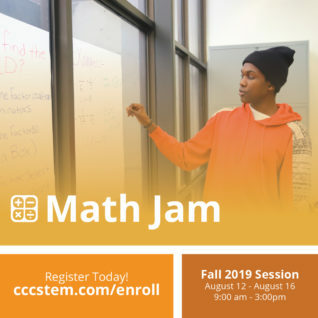 For more information, email us at mathjam@contracosta.edu or call 510.215.6856.